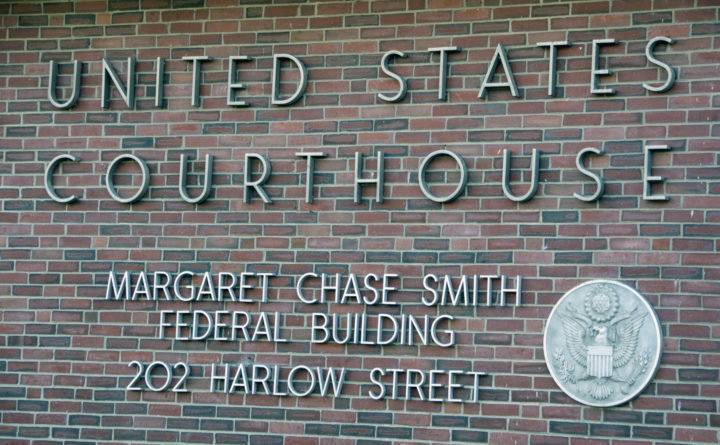 The Margaret Chase Smith Federal Building in Bangor. A Canadian outfitter and guide convicted of poaching in New Brunswick pleaded guilty Thursday in U.S. District Court in Bangor to illegally importing wildlife, according to court documents. Daniel K. Dyer, 57, of Plaster Rock, New Brunswick, admitted that on Jan. 13, 2014, he brought moose antlers and a moose hide from an animal he knew had been killed illegally in Canada into the United States through the Houlton border crossing station. Dyer was sentenced 13 months ago in Edmundston provincial court to one of the “stiffest penalties” in the history of New Brunswick for violation of the Fish and Wildlife Act, according to the Canadian Broadcasting Corp. Dyer was sentenced in April 2017 to serve a week in jail and fined more than $18,000. The federal charge in Maine stemmed from a hunting trip Dyer’s business, Lawrence Dyer and Sons Outfitters, offered to Americans in 2013 at a cost of $4,800 per person, according to court documents. The moose was killed on Sept. 28, 2013, by a West Virginia man but registered under a different name and hunting license number, court documents said. On Jan. 13, 2014, Dyer crossed the border from Canada into Maine with the moose antlers and drove to West Virginia to give them to the individual who killed the moose, according to court documents. On the way, he dropped the moose hide off at a Pennsylvania taxidermist. Dyer’s attorney, Jon Haddow of Bangor, said Thursday in an email that there is no plea agreement with prosecutors. Dyer is in ill health and he will benefit under the federal sentencing guidelines for taking responsibility for his actions, Haddow said. It is the practice of the U.S. attorney’s office, which is prosecuting the case, not to comment until a case has been resolved. Dyer remains free on $5,000 bail on the federal charge in Maine. Dyer faces up to fives years in prison and a fine of up to $250,000.